Why Did the Gadianton Robbers Wear a Lamb Skin? The Gadianton robbers and their lamb-skin. Image by Book of Mormon Central. "Behold, great and terrible was the day that they did come up to battle; and they were girded about after the manner of robbers; and they had a lamb-skin about their loins, and they were dyed in blood"
When the Gadianton robbers came to battle against the Nephite army in 3 Nephi 4, their heads were shorn, they wore head plates, they had a “lamb-skin about their loins, and they were dyed in blood.”1 Their appearance must have been shocking, for the text declares that “great and terrible was the appearance of the armies of Giddianhi, because of their armor, and because of their being dyed in blood" (3 Nephi 4:7). 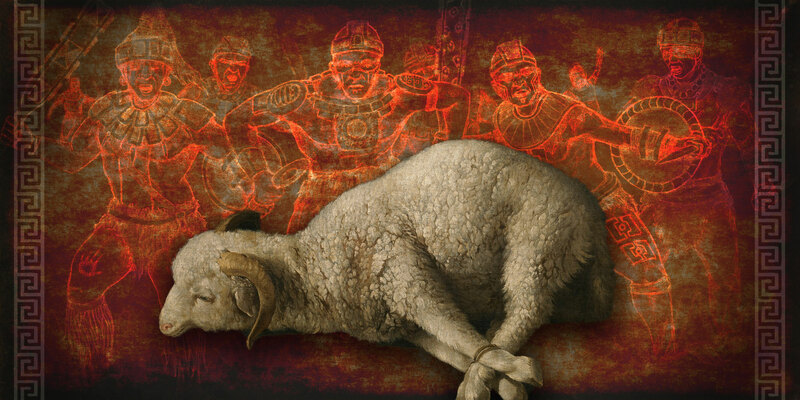 While the fierce appearance of the warriors would have been frightening, it may have been the lamb-skins and their being dyed in blood that was the most disturbing.2 Early in the Book of Mormon, the Lamanites were known to shave their heads and dress only in a skin about their loins,3 yet this scripture uniquely identifies the army as wearing a lamb-skin, possibly a new choice in garment that was particularly appalling to the Nephites. Perhaps the Gadianton robbers had girded themselves with a “lamb-skin” and had dyed themselves in blood as a visual mockery of the sacrificial Lamb of God. Since the Nephites practiced the Law of Moses, they would presumably have preferred to have an animal equivalent8 to a lamb in order to perform sacrificial ordinances at the temple.9 Thus, when 3 Nephi 4:7 describes the skin as a "lamb-skin," it may be a reference to the New World equivalent of a sacrificial lamb.10 In fighting the armies of the Nephites, Gadianton robbers’ slaughtering and wearing the skins of an animal of holy sacrifice would certainly have been a jarring image for the Nephites. While this unusual choice of a lamb (or a similar animal) may not have been terrifying for surrounding Mesoamerican cultures, the blood-stained pelt of an innocent lamb was clearly “great and terrible” (3 Nephi 4:7) to the temple-oriented Nephites.13 If the objective of the Gadianton Robbers was to stun and terrify the armies of the Nephites, the sacrilege of a slaughtered sacred symbol would surely accomplish just that. By dying their skin in blood, and girding themselves with a lamb-skin, the Gadianton robbers may have been making a mockery of the Lamb of God, whose blood was sacrificed for the sins of the world. In a temple setting, priests ritually executed lambs with solemnity and care. However, in this woeful battle, the Gadianton Robbers blasphemously slaughtered the animal and smeared themselves in blood. Despite the terror that the army of Giddianhi tried to inflict, the impactful point is that the Nephites' reaction to the ghastly appearance of the army was not to fear, but to cry unto the Lord for deliverance: “the Nephites, when they saw the appearance of the army of Giddianhi, had all fallen to the earth, and did lift their cries to the Lord their God, that he would spare them and deliver them out of the hands of their enemies” (3 Nephi 4:8). This story creates a masterful irony, since the Gadianton robbers sought to subjugate others with the blood of lambs, but in turn were defeated by those who sought deliverance from the Lamb of God. Alma and Ether declared of followers of Christ: “their garments were washed white through the blood of the Lamb” (Alma 13:11; cf. 34:36; Ether 13:10–11). While the Gadianton robbers should have been seeking forgiveness and cleansing from their sins, the garments of the Gadianton robbers were stained, rather than made white, in the blood of the lamb. By crying unto the Lord their God, the Nephites were victorious in defeating the army of Giddianhi and repelling the forces of the Adversary. One of Satan’s most powerful tactics is fear; however, despite how horrific and grim life may sometimes appear, readers can garner hope and strength by crying to the Lord their God. Because the Lamb of God shed his blood for the children of men, all can find deliverance from sin and from life’s trials. David Rolph Seely and Jo Ann H. Seely, “Behold the Lamb of God,” Ensign, April 2013, online at lds.org. Matthew Brown, “Girded About with a Lambskin,” Journal of Book of Mormon Studies 6, no. 2 (1997): 124–151. John W. Welch, “The Temple in the Book of Mormon: The Temples at the Cities of Nephi, Zarahemla, and Bountiful,” in Temples of the Ancient World: Ritual and Symbolism. ed. Donald W. Parry (Salt Lake City, UT: Deseret Book and FARMS, 1994), 297–387. 1. There is some textual ambiguity as to whether or not the Lamanites themselves or the lamb-skins were dyed in blood. Because “a lamb-skin” is singular and the subject of “dyed in blood” is plural, it seems likely that the bodies of the Lamanites were dyed in blood. 2. Matthew Brown suggested that the lamb-skin and the blood is a point of emphasis by proposing that 3 Nephi 4:7 forms a chiasm, where the turning point focuses on the lamb-skin about their loins and their being dyed in blood. See Matthew Brown, “Girded About with a Lambskin,” Journal of Book of Mormon Studies 6, no. 2 (1997): 127–128. 3. See Enos 1:20; Mosiah 10:8; Alma 3:5; Alma 43:20. The description of a leather or skin girdle is also found in the Old Testament when describing Elijah (2 Kings 1:8), and in the New Testament in describing John the Baptist (Matthew 3:4; Mark 1:6). David condemns his general Joab for pursuing war and putting “the blood of war upon his girdle that was about his loins” (1 Kings 2:5). 4. There are 26 occurrences of the word “sheep” in the Book of Mormon. Of those, only Ether 9:18 refer to an actual animal being physically present in a Book of Mormon scene. The other uses of the word “sheep” are used metaphorically when referring to ministry or to Jesus Christ. See for example 1 Nephi 22:25; Mosiah 14:6–7; Alma 5:37–38; Helaman 15:13; 3 Nephi 15:17. The word “lamb” occurs 76 times in the Book of Mormon, and is most often used metaphorically as a title for Jesus Christ. See for example Nephi’s vision in 1 Nephi 11–14, which uses the titles “the Lamb” and “Lamb of God” 39 times; also 2 Nephi 31:4–6; 2 Nephi 33:14; Alma 7:14; Mormon 9:2–6. The idea of garments being washed white through the “blood of the Lamb” is found in Alma 13:11; Alma 34:36; Ether 13:10–11. Other references to lambs would have appeared on the Brass Plates, as they are quotations of Old Testament passages (2 Nephi 15:17 [cf. Isaiah 5:17]; 2 Nephi 21:6 [cf. Isaiah 11:6]; 2 Nephi 30:12 [cf. Isaiah 11:6]; Mosiah 14:7 [cf. Isaiah 53:7]. 3 Nephi 28:22 and 4 Nephi 1:33 both refer to a “suckling lamb,” not as a title for Jesus Christ, but still in a metaphorical sense to describe the experience of the Three Nephites in a den of beasts. The phrase “suckling lamb” may be an allusion to 1 Samuel 7:9, where the phrase also occurs. 5. For evidence of “sheep” in the New World, see Wade E. Miller, Science and the Book of Mormon: Cureloms, Cumoms, Horse and More (Laguna Niguel, CA: KCT & Associates, 2010), 43–48. Wade E. Miller and Matthew Roper, “Animals in the Book of Mormon: Challenges and Perspectives,” Interpreter Blog, April 21, 2014; For evidence of the remains of a young domestic sheep in western New York, see William A. Ritchie, The Archeology of New York State (Garden City, NY: Natural History Press, 1969), 242–243. 6. The presence of the word “lamb” in the Book of Mormon may be an example of loan-shifting. For a further treatment of loan-shifting and possible explanations for the presence of post-Columbian animals in the Book of Mormon, see Book of Mormon Central, “Why are Horses Mentioned in the Book of Mormon? (Enos 1:21)” KnoWhy 75 (April 11, 2016). While the Book of Mormon frequently mentions “flocks” and “herds”, these flocks are not identified as flocks of sheep. For a discussion on the nature of “flocks and herds” in the Book of Mormon, see Brant A. Gardner, Second Witness: Analytical and Contextual Commentary on the Book of Mormon, 6 vols. (Salt Lake City, UT: Greg Kofford Books, 2007), 2:92–96. The most common example of this misconception is the story of Ammon at the waters of Sebus, guarding King Lamoni’s flocks of “sheep.” While the text never specifies what kind of animals Ammon was to protect, the flock’s susceptibility to scattering may strongly suggest that they were not sheep. See Gardner, Second Witness, 4:174–276. 8. Lambs were preferred, but not required, for burnt offerings (Leviticus 1), peace offerings (Leviticus 3), and sin offerings (Leviticus 4). However, for a trespass offering (Leviticus 5:14–19) and for the Passover (Exodus 12), sheep were indeed required. The Day of Atonement required the sacrifice of both a bullock and a goat to serve as the “scapegoat” (Leviticus 16). 9. Several scholars have presented evidence to suggest that Nephi and his descendants built a temple after the manner of Solomon, strictly followed the Law of Moses, and officiated in the Melchizedek Priesthood. See John W. Welch, “The Temple in the Book of Mormon: The Temples at the Cities of Nephi, Zarahemla, and Bountiful,” in Temples of the Ancient World: Ritual and Symbolism, ed. Donald W. Parry (Salt Lake City and Provo, UT: Deseret Book and FARMS, 1994), 297–387; John W. Welch, “The Melchizedek Material in Alma 13:13–19,” in By Study and Also by Faith: Essays in Honor of Hugh W. Nibley, ed. John M. Lundquist and Stephen D. Ricks (Salt Lake City and Provo, UT: Deseret Book and FARMS, 1990), 2:238–72; Daniel C. Peterson, “Priesthood in Mosiah,” in The Book of Mormon: Mosiah, Salvation Only through Christ, ed. Monte S. Nyman and Charles D. Tate Jr. (Provo, UT: Religious Studies Center, Brigham Young University, 1991), 187–210. 10. Mosiah 2:3 explicitly states that the Nephites “took of the firstlings of their flocks, that they might offer sacrifice and burnt offerings according to the Law of Moses.” While the Book of Mormon never indicates which animals they used for which sacrifices, they were clearly using domesticated animals to serve as their sacrificial offering. 12. Gardner, Second Witness, 5:263. 13. Not only the animal’s identity would have been terrifying, but also the blood because of Israelite laws of blood contamination. See Leviticus 6:27; 12:1–5; 17:10–12; 1 Kings 2:5. 14. Ethan Sproat argued that the term “skins” in the Book of Mormon may be a reference to Adam and Eve’s “coats of skins,” and that the “skins” of the Lamanites is a reference to some item of clothing that asserted their right to authority. Sproat further connects the blood-stained lamb-skin in 3 Nephi 4 with an actual temple ritual described in 1 Kings 2. See Ethan Sproat, “Skins as Garments in the Book of Mormon: A Textual Exegesis,” Journal of Book of Mormon Studies 24 (2015): 149–158. Matthew Brown suggested that the lamb-skin they wore may represent a ceremonial apron or ephod, familiar to Israelite temple worship, as well as Mesoamerican royal aprons. See Brown, “Girded About with a Lambskin,” 124–151. 15. Brown, “Girded About with a Lambskin,” 146–148. Hugh Nibley discusses how in various ancient cultures, the donning of skins or garments transfers to the wearer the powers and virtues of the animal or garment. If the Gadianton robbers subscribed to such belief, they may have been seeking to coopt the power of the Lamb of God. See Hugh Nibley, Temple and Cosmos, The Collected Works of Hugh Nibley: Volume 12 (Salt Lake City/Provo, UT: Deseret Book and FARMS, 1992), 112–132.